Find the Family and ensure that no student in the family is actively enrolled in a class. If a student is actively enrolled in a class, they must be dropped prior to moving the Family to the Lead File. Click the Archive Family button in the Family's Record. In the Archive Family to Lead File window, select Export to File. Export the data to Excel and save the exported Excel file to your computer. After saving the exported data, return to Jackrabbit and click the Archive Family to Lead File button. A Lead File record is created for each student in the family. 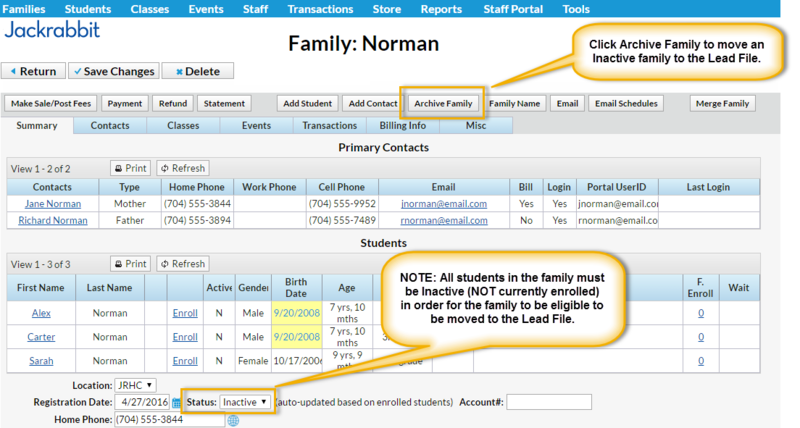 If the Family has more than one Student, a separate Lead File record will be created for EACH Student.